Are you looking for Harley Davidson Touring Bagger Air Ride? 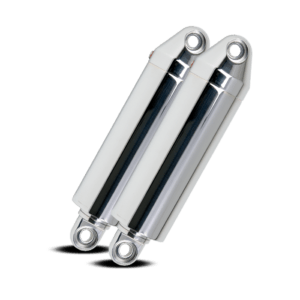 Platinum Air Suspension has the high quality simple air suspension for your fl and flht harley davidson bagger. 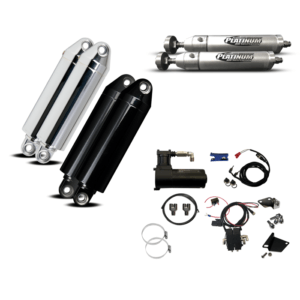 Platinum’s Long Travel Air Ride Kit is perfect for any FL and FLHT Harley Davidson Touring model. The kit is available in both black and chrome and gives your bagger up 4.25 of rear lift. 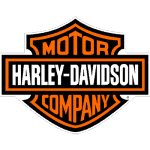 Have Questions About Harley Davidson Touring Bagger Air Ride ? Have a question whether or not Platinum’s Harley Davidson Touring Bagger Air Ride kit works for you? The expert technicians at Platinum are extremely knowledgeable when it comes to your Harley Davidson Touring Bagger Air Ride . 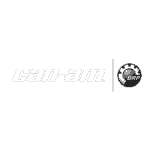 Platinum Air Suspension technicians have been serving the big wheel bagger industry for over 15 years. 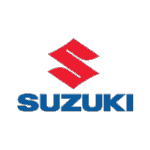 Furthermore, they are well versed in all aspect of improving the ride and lowering your FL and FLHT Harley Davidson Touring Bagger Air Ride . Call Platinum Air Suspension and talk to a Platinum Air Suspension team member. 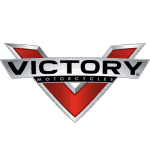 We will glady help you refine your vision and create a plan of attack and find all the RIGHT parts you will need to convert your FL and FLHT Harley Davidson Touring bagger into a low and mean bagger. It’s All About The Ride. 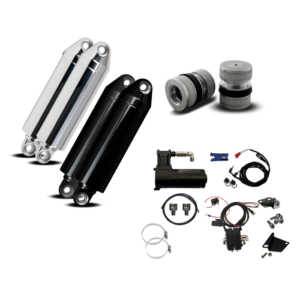 Platinum Air Suspension has everything you need to lower your Harley Davidson Bagger. Once again, Platinum Air Suspension set out to improve your rides performance and comfort by completely redesigning its FLH and FLHT air ride system. 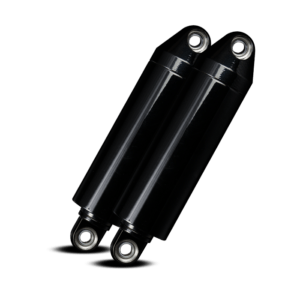 The new Long Travel shock options features a redesigned machined eyelet, an air tight locking ring, new cylinder and longer rod. All of these new features result in an improved air ride system and a lower sitting height for your ride. The Long Travel system has a maximum extension 13 ½ inches. And at minimum retraction of 9 ¼ inches.  Your bike will sit at least an inch lower than Platinum’s traditional FLH system. 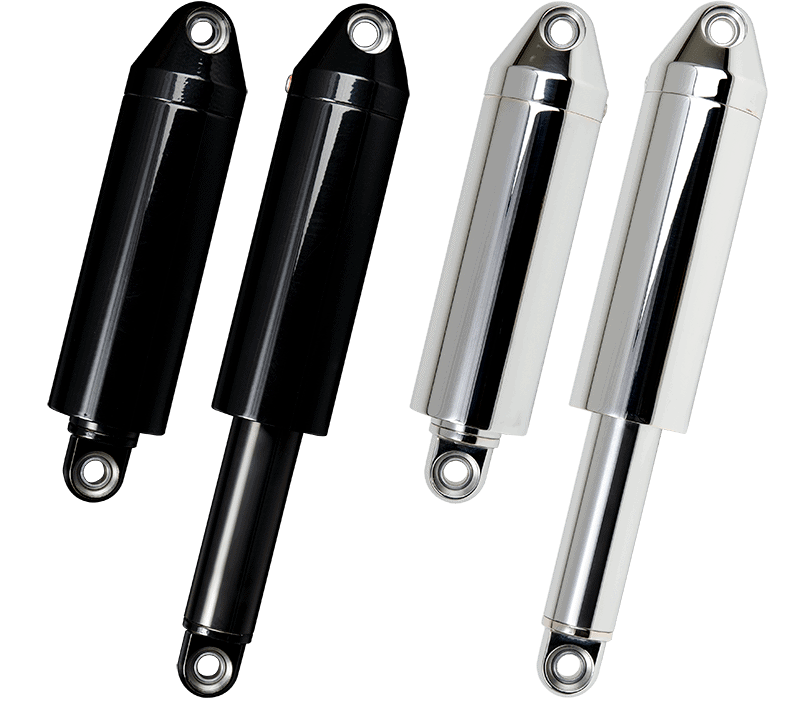 The new shocks is available in chrome or high gloss black with Blacked Out Rod. The Blacked Out Option features an extremely durable and scratch resistant paint that is tough and can handle the wear and tear. But the result, everything and even the rod is black! Furthermore, Platinum’s Long Travel system is also available with a front air ride system with your choice of air pucks or air cylinder. Platinum Air Suspension offers a variety of options to lower the front of your FL and FLHT Harley Davidson Bagger. If we don’t carry what you’re looking for… we can get it ordered for you. 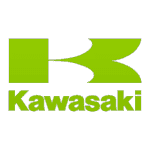 Because we have built a great relationship with many vendors and manufacturers throughout the industry. 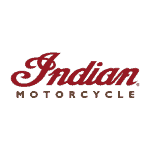 Most of all, the team at Platinum Air Suspension cares about your Harley Davidson Bagger. Platinum Air Suspension professional staff are eager to answer those questions. 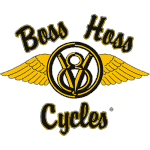 We will always give you the personal service you deserve and answer the questions you have in regards to lowering your Harley Davidson Bagger. At Platinum Air Suspension – It’s all about the ride. Let us help you determine the aftermarket and bagger parts you will need to lower your Harley Davidson bagger.